Interior wood walls are all the rage lately. 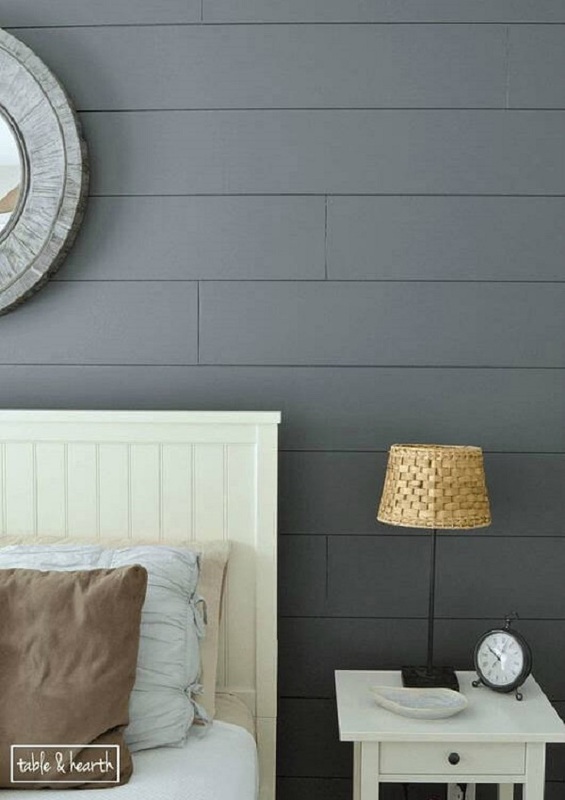 It’s a fascinating trend in 2019, and these top 10 wood wall ideas will show you why. Interior wooden walls have made a fantastic transformation from the thin wood panels that were popular in the 1960s. We are talking about real wood with real warmth, sometimes borrowed from a centuries-old barn or discarded pallets. Wood can be reclaimed and restored for some interior projects that will turn a room into a place of peace and serenity. Not all homes are rustic, Southwestern or country that soar with the appreciation of old wood. Here you will find many modern homes that are also capitalizing on the value of wood to add a touch of character, making a house feel more like a home. The room reflects a coastal, weathered, and neutral style inspired by the beach. Sleek while lightly textured, the color tone and whisper of open seas turn this wall into a lovely focal point. 1/4″ plywood underlayment was cut into 8″ planks at a home improvement warehouse. Inexpensive and easy to install and paint, a classic beach look is a result. Four walls can begin to close in on you when working. You won’t have far to go for a break when a cozy little suite is added to your room. Gather a variety of boards that measure 3′ to 4′ in length. Sand, stain, and finish with a good sealer. Determine your area where breaks will be taken and wrap it around the room. Start with the floor, continue up one wall, across the ceiling and down the other wall. Outfit with a sofa cushion, bean bag and anything else that will help you relax. Hang curtains to shut out the world and take in the soothing wood atmosphere. Backdoor hallways and mudrooms do not have to be elegant in design. They are for getting out of working clothes and feeling the relief of coming home. No worries of getting these rooms dirty with comfy whitewashed walls and a coat rack for your outer garments. Use thin strips of old wood and run vertically to make the room appear larger. Dry brush white paint to bring about an old, comfortable look. Shabby chic brings a charming appearance and feels with loads of antiques and other old stuff. Simplicity rules, but the mixture of quaint and past days and ways deliver a relaxing realm. Old boards turned vertically do not have to be refinished to provide the luxury of age. Set your favorite stuff around and feel at home in another era. A kitchen that is visible from a connecting living room needs a wow factor. By turning a plain neutral wall into a work of art, the whole dimension of the room is changed. Simple plywood sheathing cut into 5″ strips started the process of this creative breakfast nook. There is no blueprint on where to place what. Just go with it and create! This wall of odd-sized weathered boards takes the dreariness out of a small half bath. Stretching horizontally across the back of the stool, the little corner seems to emerge with warmth and size. Just sand, cut and add a flat finish to protect from dust and dirt. Transitional styles are growing in popularity and enable you to mix the best of 2 worlds of decor. Here, contemporary meets rustic with a sophisticated twist. The rough wood warms the area and makes it very accepting to marble and glass. Get away from it all in this delightful country garden shed that uses wood to distinguish the space from the rest of the world. Weathered boards of different sizes can be used to dress up both walls and ceiling. Heaven on earth to your gardening hobby. This room can also be designed as a mudroom that leads into a house or an attachment to a garage. Visit Howtoplans.org, an excellent source for finding free plans for building a shed. The peaceful feeling of a mountain lodge can be yours, even in the middle of the city. Barn wood is the latest in wall coverings that will last forever. Old barns may be over as far as housing animals from the weather, but the character and history will always remain. No worry about perfection. You are here to relax. Modern and Minimized decors can gain warmth in the midst of glass, straight lines, and metal. By adding large squares of wood veneer to a focus wall, wood can create an ambiance of sophistication. Better yet, this professional-looking job can be a DIY project and cost less than $50.